In fundraising, we work with constantly changing people (co-workers, students, donors) on a daily basis. We always hope that people will change, start to do something different, or do something more—especially when it comes to donors. What makes some of us more successful than others when pleasing people, and more importantly, getting them to act or change their behavior? We have all pondered at one point why someone made a decision, or why someone cared more than you did. 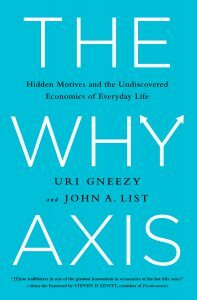 In The Why Axis (published in 2014), economists John List and Uri Gneezy discuss incentives that motivate people and why. The authors are part of a new movement that is having a big impact on our field of fundraising: behavioral economics. The Why Axis summarizes various field experiments in education, fundraising, and competition through behavior economics. This is new territory—economics in the past has mostly been based on theory and these authors sought to prove something. They’ve been the recipients of major grants and done some the controversial work in motivating students and consumers. One example was a comparison experiment in the most matrilineal (The Khasi of northeast India) and patriarchal (The Masai in Tanzania) societies of the world. List and Gneezy found that socialization had a significant impact on the willingness of men and women to compete or take a risk for potential rewards. I was particularly interested in this experiment because I lived in Shillong, India, amidst the Khasi culture between the age of 4 and 5. I recently spoke to my parents about the female hierarchy in the school system, which I found to be very comparable to the results that Gneezy and List concluded during their field experiments. 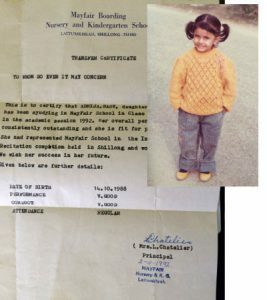 A picture of me as a 2nd grader around the time I lived in Shilong, India, along with my kindergarten certificate—I was doing something right! Randomization of subjects: to make sure the experiments show real differences. Realism: the results matter to the participants, the rewards are real, and they tend to forget they are part of an experiment. For example, students who work for a higher test score in exchange for a monetary reward actually get the money if they win, and competitors in a game actually get the prize if they take a risk and compete. In the fundraising experiments, the results from the charities are real, not simulated. Incentives can be motivating, if they are the right kind of incentive. Immediate incentives tend to be the most effective, but the best incentive isn’t always money or something tangible. Sometimes it’s a feeling or a sense of connection. Powerful fundraising campaigns have been figuring this out. Economic discrimination occurs more often than you think. Perception makes a big difference in behavior. For instance, the type of fundraiser or the images used in a communication can impact giving behavior. A cause close to the heart of a donor or an image they find more pleasing may trigger a more positive response. Fundraisers need to experiment to determine how best to connect with different types of donors. Change can happen in a more egalitarian way for women. According to the book, “the percentage of men and women who chose competition, per society, tells the culture story.” In our country, men tend to choose competition way more than women. Thus, it is pertinent to rid ourselves of the gender bias that persists in this country. On a global front, women have shown less desire to compete. The authors discuss that if women are raised in the “right” culture, gender gap and competition disappear. Women who live in matrilineal societies tend to be more competitive than men. This has important implications for fundraisers. For example, in the most recent AFP Compensation Survey, male fundraisers reported being paid 30 percent higher on average than women, even though 75 percent of AFP members are women. We have work to do. What happens next, particularly in education? Gneezy says that the next step is to learn more about production function, which is setting up defined causal relationships as incentives in the education industry. “Public education has been around for 100 years, we still know little of what works.” The big push now is to try out these field experiments in classrooms – big versus small classrooms, picking random students, and providing real incentives to see what works. This book gets two thumbs up from me. I appreciate the practical field experiments, and if those don’t catch your attention, the incredible anecdotes from wide-ranging fields of education, fundraising and marketing will open your mind. Grab a copy. You won’t be disappointed.